Fig. 1. IC-756Pro II & IC-746Pro Spectral Keying Graphs (Rise Time = 4 mS). The attached spectra used a 1500 Hz DSP SSB filter with a higher shape factor and less steep sides. The two sets of spectra are very nearly the same over the frequency range +/- 300 Hz from the center frequency of 700 Hz, but the wider filter allows more of the keyed waveform spectrum to be observed. 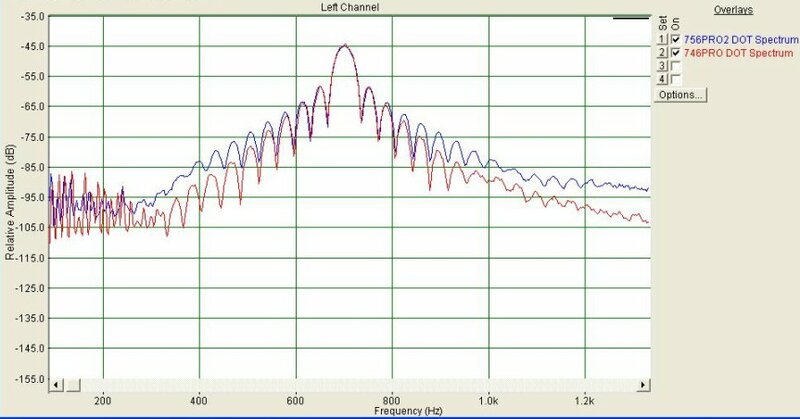 For either PRO the keyed spectral components less than 50 dB below the spectral central peak lie within a range from about 300 Hz to 1400 Hz for the PRO2 ( 1100 Hz)and 400 Hz to 1100 Hz for the 746PRO (700 Hz). The main spectral peak was centered at 702.5 Hz with a -6 dB width of 29.2 Hz corresponding to a Q of 24.1. The keying and break-in capabilities of the 746PRO have clearly been improved over those of the 756PRO2. The procedure involved using first one PRO as a keyed CW transmitter and the other PRO as a monitor receiver and then reversing their roles. The line-level, constant amplitude audio output from the rear-panel accessory connector of each receiver was delivered through a wide-range isolation transformer (Furman IP2-B) to a pro-audio analysis program (not SpectroGram) for spectral estimation and plotting. After each transmitter was dot-keyed for about one minute with the program performing a running average of 500 spectra, the averaged spectrum was plotted and saved. Then the roles of the radios were reversed. The keying mode for each transmitter was Full-Break-In and at the keying speed used there was considerable dot-shortening relative to space timing. This was chosen to be a typical mode of operation and probably a worst-case situation for each transmitter at the high speed used. The PROs were dial-calibrated to be within less than one Hz of WWV and each other. The tests were made on 14010 kHz. Both radios were set to that dial frequency which was subsequently untouched. Both radios are set up for a 700 Hz CW offset. Each was set to CW mode with a near maximum internal keyer speed of around 50-60 wpm, and 4 mS risetime. Exact keying rate was not measured, but both were adjusted such that their spectral peaks overlaid and were thus equal. Each was adjusted for 5 watts key-down power to the same dummy load. No difference was observed in the spectra with higher power. Since I normally operate QRP CW at 5 watts, I chose to use that power level. The signal in each receiver, when in its monitor role with its antenna input switched out, was about S9+20 dB. Observation of the monitoring receiver audio output on a scope revealed no evidence of audio distortion. The transmitter was keyed with continuous dots for abut one minute until visual observation of the running-average spectrum showed no further changes. Then the spectrum was captured and plotted as shown on the attachment. The transceiver roles were then interchanged and the test repeated. The resultant spectrum was then saved and plotted on the overlay as shown. Note that both spectra were set to the same peak level (-45 dB) and centered on approximately 700 Hz. Close examination of the keyed waveform (time domain) of both transmitters shows identical transitions from off to start of rise-time (rounded) to start of full output (abrupt) to start of fall time (rounded) to return to zero output (rounded). Thus, there is only one abrupt harmonic-generating transition that I can observe. By way of contrast, a popular mid-priced HF transceiver has very abrupt transitions , and consequently has been noted to have an overall keyed bandwidth approaching 2 kHz. While I can never defend using an audio spectrum analysis program vs. a genuine r-f spectrum analyzer, in this case with careful attention being paid to maintaining clean signals under linear operating conditions, I do feel that these results have validity. In a relative sense, they do confirm that the "apparent" keying spectrum of the 746PRO represents a measurable improvement over the 756PRO2; the 746PRO appears to have a much narrower keyed spectrum than "other" transmitters. Click here for relevant links.